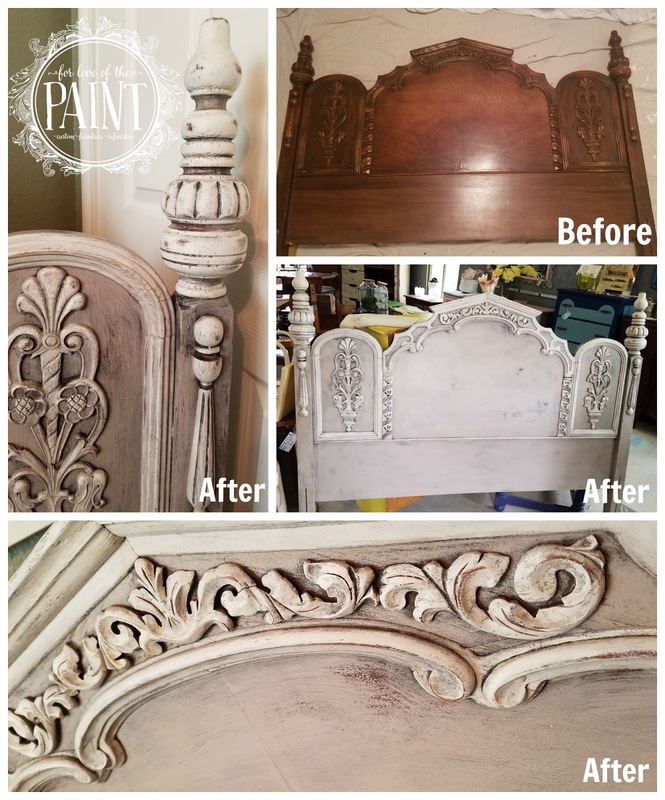 One of my most recent projects is a super cool distressed / cottage / shabby chic look with Annie Sloan Chalk Paint blended and layered in Paloma, Paris Grey, and Pure White! I love that it's a little bit of a departure from what I 'usually' do, but that it's still classic and gorgeously elegant - while still being a little down to earth and approachable! 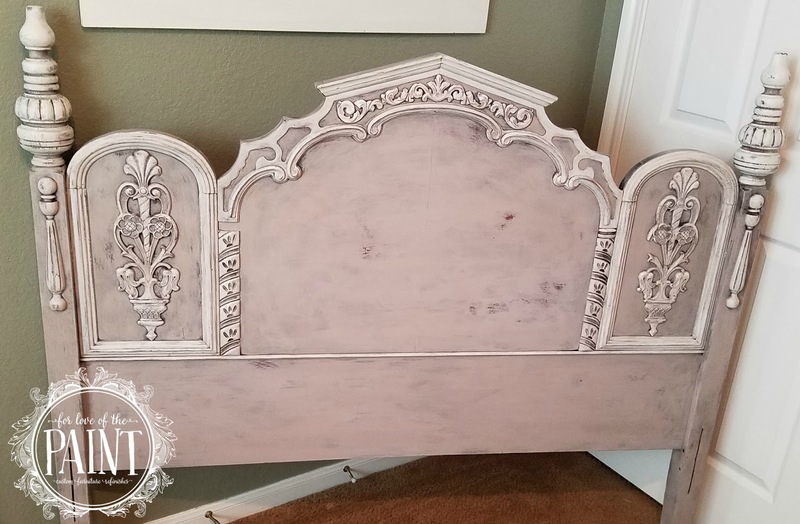 This gorgeous headboard came from a bedroom set that included a beautiful small chest / nightstand that I painted in Antibes a few months ago. Remember this adorable green piece on the left? One of my favorites! 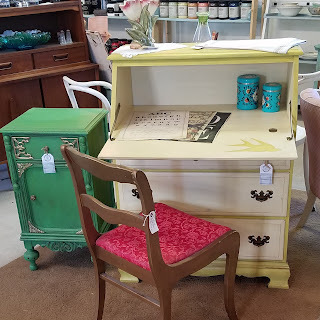 Well, this next project is a testament to the versatility of the Annie Sloan color line - these chalk paints can be bold and beautiful, or soft and sophisticated. And no, they don't pay me to say that.. I just really dig the vintage-inspired colors! Anyway, I absolutely ADORE this carved oak bedroom set! I will probably paint the large chest of drawers in a beautiful neutral, but I would realllly love to see it in a fabulous jewel tone! In the meantime, I decided to play with some leftover custom blended paint and incorporate it into this project. Isn't it amazing how different this looks from the green chest now? Read on to see how we achieved this awesomely shabby chic look! I recently used Paloma mixed with just a hint of metallic from Modern Masters Warm Silver, and decided to use this as my base coat. First, I applied an allover color base of the Paloma blended with Paris Grey. I used a little additional water in the paint in some areas for a bit more of a color wash, and gradually built up layers, painting with a large round brush in multiple directions. 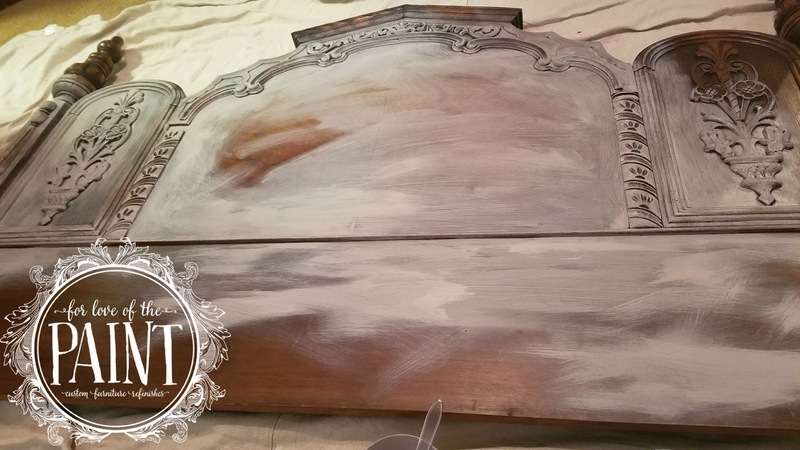 This allowed the original wood stain to show through in a few areas, but also let the paint settle into the oak grain a bit more softly instead of either fully saturating the grain or leaving it exposed. The variation in finish gave a soft, natural wear look to the end result! Once the allover color was done, I took some of the original color blend and some Pure White, and applied this new, lighter blend with a damp detail brush. Look at the huge difference it makes versus an allover color! I once read that the difference between "homemade" and "handmade" is the finishing details. 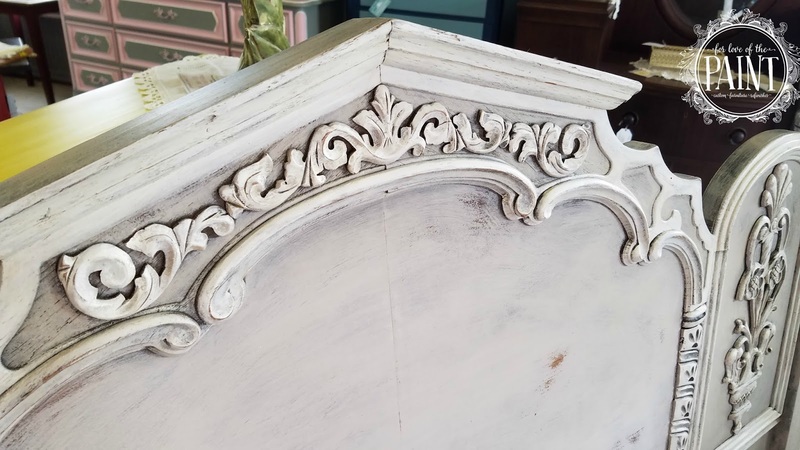 This trim detail is really a subtle color difference, but it makes an enormous impact! Once all the trim was highlighted, I lightly distressed with a sanding block. I find them much more natural than sandpaper, but this is totally a matter of personal preference! 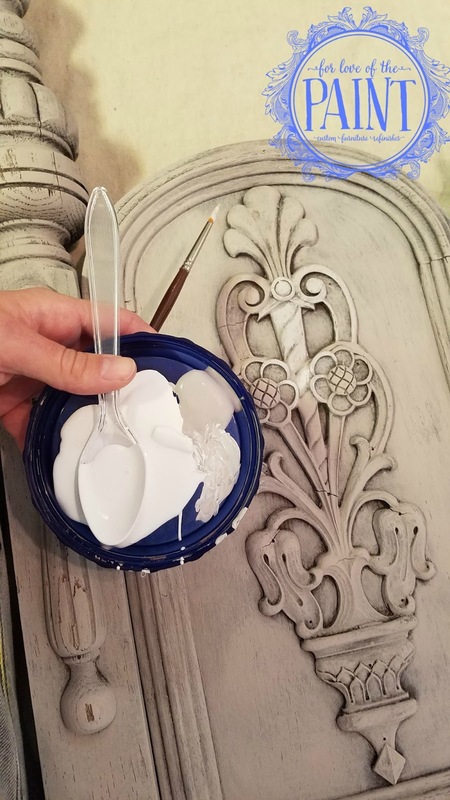 I used a combination of dry and wet sanding for the edges, AND I pressed the bristles of the brush backwards in some damp areas to achieve this gorgeously chipped effect! And here's the full piece. What a huge change!! What do you love to see? Bright, vibrant, bold colors, or deliciously subtle neutrals?? I'd love to hear your favorites! Hi! I love this and hope to somewhat do the same thing with a headboard/footboard that I just bought. What was your ratio of the Paloma and Paris Gray mixture? Hi Kim, thanks for reaching out! For this piece, I didn't measure since I was using a remainder of the Paloma that had been blended with a hint of Warm Silver.. but I think it ended up being close to 50/50. Good luck and have fun with your project! !